Did you feel it this weekend? It’s Springtime! The sunshine and time change have done numbers on my quality of life. I spent my weekend cooking, spending time with friends, laughing, singing, climbing and lounging. Friday night, I enjoyed a casual night home with my friend, Masha, wine and homemade Pistachio Ice Cream Sandwiches. 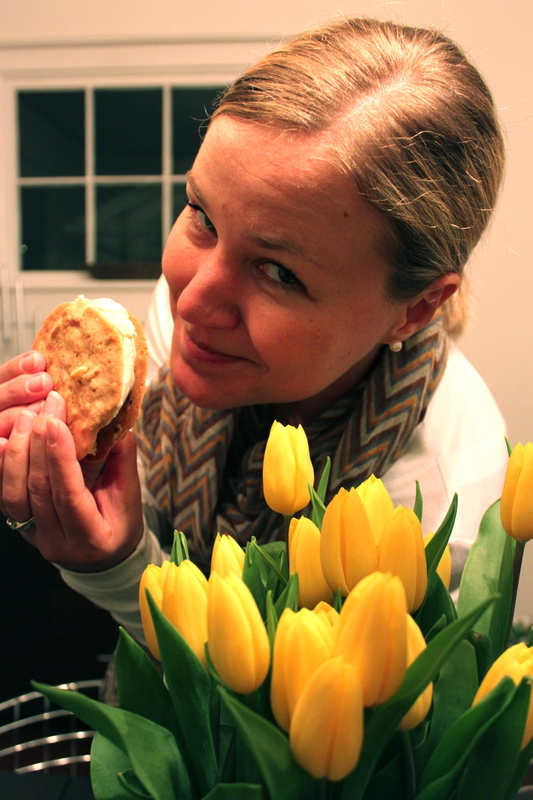 In fact, the last time I made ice cream sandwiches was this summer in Florida with Masha on vacation. We made Margarita Cookie Sandwiches that were to die for! They were much more time intensive though. These Pistachio Ice Cream Sandwiches are much easier – just buy Ciao Bella Pistachio Gellato and Fresh Market Almond Cookie Crisps – then sandwich them together. You can make them in advance and wrap in plastic. Or just assemble them quickly and serve them up. The combination of pistachio and rich almond cookies is so irresistible! These ice cream sandwiches will certainly make you sweet for Spring.